Great shot. You really hit a fine line with the contrast. Well done. Not at all a standard shot. Very nice! Is there anyway to get this in HI-Res? Just wanna use it as my desktop image. So beautiful! 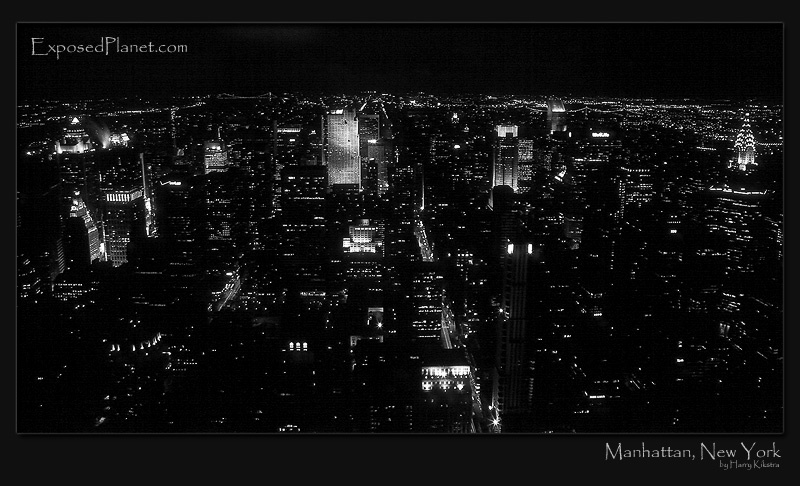 Love the B&W and clarity of the twinkling lights below. beutiful,one day and I\'ll be there! The story behind "Manhattan New York at night, from Empire State Building"
Well, now for something completely different. New York, New York, big city of Dreams..
For someone who likes to be away from it all and wander in nature, I really enjoyed New York a lot when visiting it in February 2002. Jogging through the snow in Central Park, sleeping for a few dollars in a crappy place in Spanish Harlem and wandering around all the nice little neighborhoods that contain so many different cultures. Shot on B&W slide film with EOS3, scanned later.